Monitor the status of your battery and power. Is there a better alternative to BattMan? Is BattMan really the best app in System category? Will BattMan work good on macOS 10.13.4? 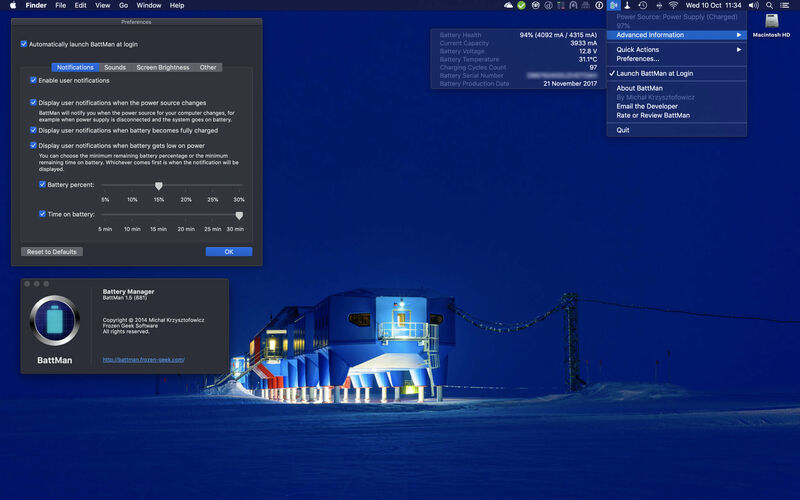 BattMan is a little application living entirely in your menu bar and monitoring the status of your battery and power. Display a User Notification to inform you that the system switched from one power source to another (e.g. when going from power supply to battery). Display a User Notification to inform you that the battery is low. You can configure the thresholds for both remaining time and remaining percentage and the User Notification will be displayed for whichever comes first, giving you plenty of time to find the power supply, save your work or do a proper system shutdown. BattMan needs a review. Be the first to review this app and get the discussion started! BattMan needs a rating. Be the first to rate this app and get the discussion started! 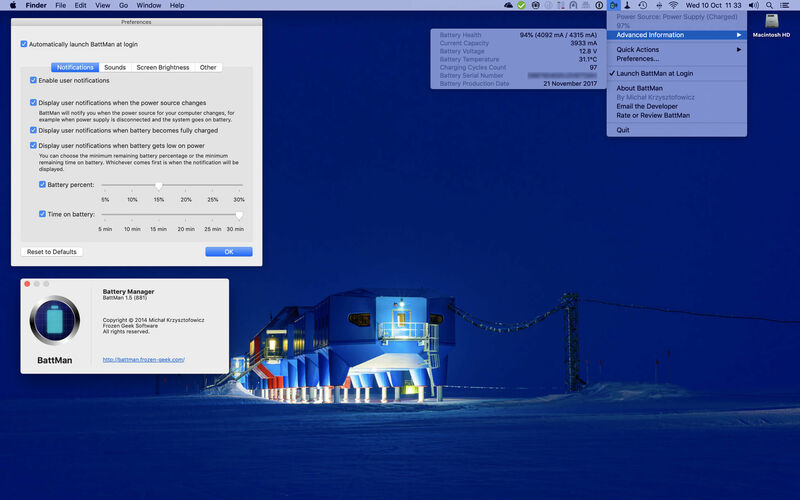 Use several different icons in the menu bar to indicate battery and charging states. With one quick glance of an eye you'll instantly know whether the battery is fully charged or at a low level, or if there's a power supply connected to your computer. Display, in a sub-menu, all information about the battery that the system provides, such as: battery health, current capacity, voltage, charging or draining current, battery temperature and more. All notifications can be accompanied by an audible alert. These can also be turned off whenever you need to. Provide you with a quick access menu to quickly disable or enable notifications or audible alerts, without the need to open BattMan Preferences window. Ideal for meetings and other cases where you want to avoid distractions. On OS X 10.9 Mavericks, list applications using significant energy. Note: Although there's no reason for BattMan not to run on a desktop Mac, it's really only useful on portable computers.